Climate change is a huge problem and it has to be solved fast if we want to prevent the worst from occurring. Meanwhile, the current economic downturn makes it hard to implement costly and high tech solutions. Three different studies point to the same conclusion: energy conservation is the cheapest solution to decrease our greenhouse gases emissions. As a matter of fact, it could enable us to save a lot of money. One could imagine that the savings brought by such projects could finance more expansive ones like solar, wind or nuclear plants. Not insulated houses like the one above – blue means less heat losses, red and white the most – can cut their energy consumption and start saving now. The first one was already the subject of a previous post. 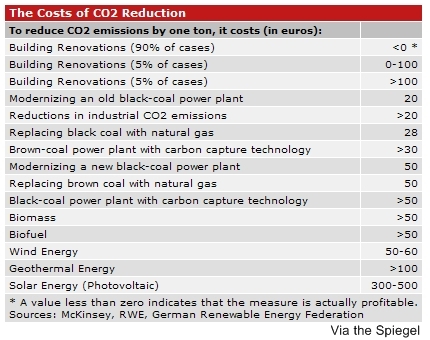 Indeed, McKinsey noted that energy efficiency could account for 14 gigatons of CO2 (GtCO2) equivalent per year by 2030. That’s right: insulating buildings can save up to $40 per year for each ton of carbon dioxide ! Industry and transport could save $10 per ton per year. 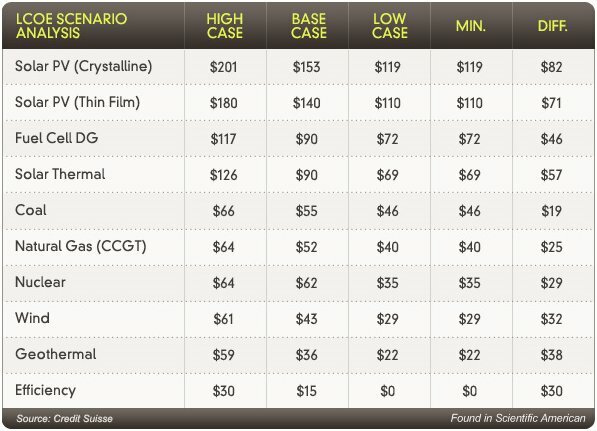 And now, something new: the Scientific American published a study on the various energy sources stating that geothermal could compete with coal on prices ! In each of these three tables, efficiency and conservation are the cheapest way. One could imagine that the savings brought by such projects could finance the more expansive like solar, wind or nuclear. 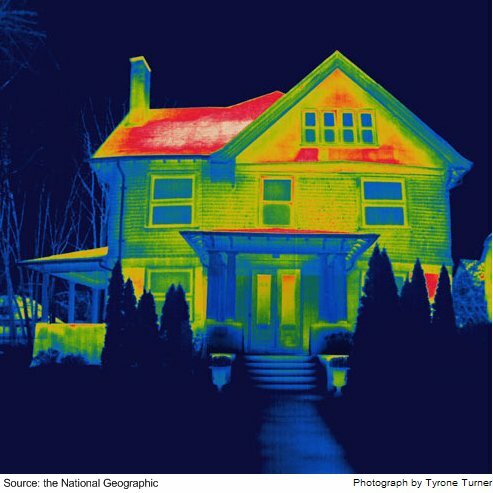 Last but not least, the National Geographic published a huge article on energy conservation that I strongly recommend. This is one problem with carbon tax and emissions trading schemes: people see the higher price, adjust their behaviour and settle into a new balance of spending and emissions; to continue the behaviour change you must keep raising the price so they keep adjusting. Essentially, people only change when they’re annoyed, so you have to keep annoying them. Not many governments in democracies will be eager to keep annoying the electorate. Certainly, people are changing. Time and again I’ve mentioned the example of war crimes treaties in reducing the horrors of war. Certainly horrors continue, but we simply can not imagine something like the firebombing of Dresden happening today. But this was a process of about a century. Likewise, people change in attitudes and then a social tipping point is reached where many things change quickly, as for example with segregation in the US. But again it was a century between the freeing of slaves and the end of (official) segregation. So change certainly does happen. The only question is whether it’s quick enough to avoid more terrible things happening. Well, considering what has been done in two years, I am optimistic. You know, when I started blogging people weren’t that informed and didn’t see the importance of their actions in the process of mitigating climate change. Now they do and started to act. Be a bit optimistic Kiashu, I am. Off course, the road is long, but it is only the beginning. Yes, I concur with the title. The question is, How we are going to change consumer behaviour. People already know about the numerous benefits of energy saving appliances and techniques, specially the saving up on your wallet but still, people still are unaware of what the future will bring to us. I truly believe that more posts like should be spread out onto the web but with more visual and harsh visuals/commentaries. I mean come on, our natural resources are going to eventually finish up and already the environment is sort of giving its message with the lately natural disaster in Hahiti and now in Chile. People should really start to change their habits for their wallet sake and also the environments.Thank you for this post.I just wished everyone could have a read at it. Will recommend it. I am an advocate of energy efficiency and conservation measures since the writing of my Master’s thesis on the energy consumption in the French residential sector. I also provide all the latest news on that aspect of the energy / environment equation as I believe it is the very basis of sustainability. I hope you will keep liking this blog !